Is this haunting big city cry ballad the only 45 that Rick Thompson ever cut? It may well have been but We All Make Mistakes Sometime on its own is good enough to match singers whose careers were much more extensive. It was cut in New York by King Davis and arranger Trvir Lawrence set Billy Frazier's lovely melody in an orchestral arrangement typical of that city’s uptown productions – gentle rhythm, cooing girl chorus, swirling strings – the works. But Thompson rises above it all quite triumphant, showing a great sense of dynamics, and with some exhilarating high tenor flourishes. Not only a very fine deep soul track but one of great beauty as well. The mid tempo flip has found some favour on the dance floor but isn’t patch on this side. I presume this guy isn’t the same as the guitarist in BT Express. Can anybody comfirm? UPDATE ~ John "Soul" Smith has kindly been in touch to say that Rick is indeed the lead guitarist for BT Express. 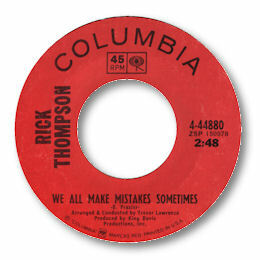 He adds "his 'solo' version of "We All Make Mistakes" came out around June 69. Earlier he had handled lead vocal duties (as Richard Thomas) on the King Davis Houserockers Verve 45 version of the song that take of "We All Make Mistakes Sometimes" being released around April 67. Other members of the King Davis Houserockers (who were a New York area covers band) also ended up in B.T. Express. So now there are two members of BT Express on these pages - Rick Thompson here and the lead singer Barbara Joyce of the Uptights. I'm very grateful to John as always for his info.